From Aspen to Abita Springs, cities are committing to running on 100 percent renewable energy. Greg Lemons is the staunchly Republican mayor of Abita Springs, a bite-size town in rural Louisiana that both draws its water and gets its name from the famous and pristine aquifer that flows beneath its soil. A chatty and cheerful fellow, Lemons likes to think of himself as a pragmatic leader, the sort of person who strives to fix problems instead of fight about them. Nevertheless, in late 2014, he found himself in a legal brawl. It was autumn of that year when he first heard that the Louisiana Department of Natural Resources had approved an exploratory drilling permit for a proposed fracking project just outside of town. The project, which had been approved despite the mayor’s protests, didn’t sit well with him. He feared it would degrade the community’s environment, disrupt its quality of life, and ruin its reputation. In late December 2014, he sued, arguing in state court that the drilling permit violated local zoning ordinances. Though Abita Springs quickly lost its legal case and exploratory drilling commenced, the fracking project ultimately folded for financial reasons. In the meantime, Lemons learned some important lessons. While he fought the frackers, with their noxious chemicals and earth-shattering drills, the mayor started reading up on alternatives to oil, gas, and coal. He educated himself about solar panels and wind farms, about energy-efficient lighting and electrical vehicles. He learned about the jobs that these technologies could help create and the budget savings they might enable. Being a business-minded member of the GOP, he liked what he saw. Soon enough, he was enamored with the economic and environmental promise of green energy. So, alongside other residents in his town of 2,500, he set to work. He formed a committee to research and develop renewable-energy plans for the city. He started replacing all the town’s light bulbs with energy-efficient alternatives. He initiated talks with local electricity providers, hoping to obtain solar-powered street lights, install solar panels on municipal buildings, and perhaps even develop a solar farm outside of town in the months and years ahead. He crafted a plan to bring electric vehicle charging stations to Abita Springs. And in March of this year, in order to signal an official commitment to these lofty goals, Mayor Lemons joined the Sierra Club’s Ready for 100 campaign, announcing that his town will strive to run on 100 percent renewable energy by 2030. Little Abita Springs, in other words, is putting the Trump administration to shame. And it’s not alone. As the White House withdraws from the Paris climate agreement, as it capitulates to the reactionary agenda of fossil-fuel interests, small towns and large cities alike are stepping into the breach. The very day Trump turned his back on Paris, 285 mayors across the country announced that they would still uphold the agreement’s goals. 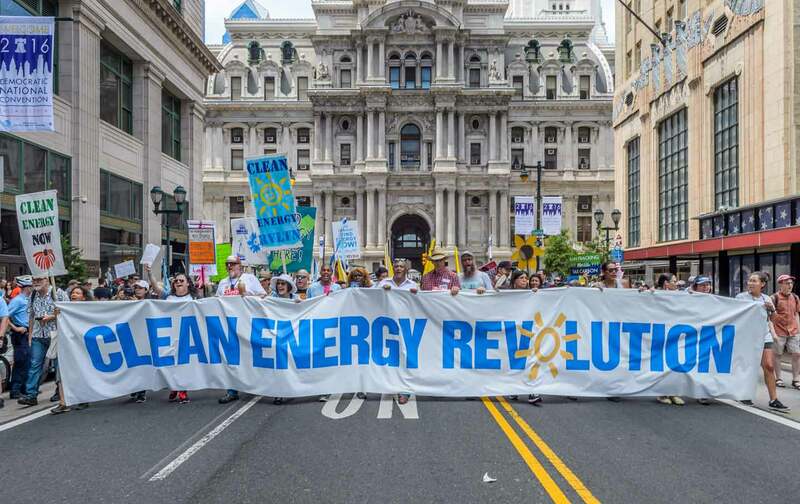 Thirty cities, meanwhile, have joined the Sierra Club’s Ready for 100 campaign, committing themselves entirely to renewable energy in the coming decades. And though large progressive centers like San Francisco and Portland, Oregon, often get the most attention, it’s tiny towns and small cities above all that have acted quickly—and with strong commitment—to reshape their energy economies to save money, create jobs, and combat climate change. From Abita Springs to Georgetown, Texas, and Greensburg, Kanas, little communities laboring out of the spotlight are walking away from fossil fuels, and fast. Take, for example, Greensburg, Kansas, a tiny heartland town of 700 people that was nearly wiped off the map by a massive tornado back in 2007. After its harrowing run in with the weather, residents decided to rebuild the community around green energy. Just months after the tornado, the city council adopted a “sustainable comprehensive plan” that charted the course for obtaining renewable power. Five years later, Greensburg started getting every bit of its electricity from solar and geothermal sources as well as a 12.5 megawatt wind farm that sits outside the town’s borders. Oil, gas, and coal have been cut out entirely. Consider Georgetown, Texas, too. Its transition to renewable energy started in 2010, when students at locally based Southwestern University convinced officials there to work with the city-owned utility, Georgetown Utility Systems, to derive all the campus’s electricity needs from wind and solar sources. Seeing the budgetary stability that decades-long, fixed-rate renewable energy contracts offered the school, the city soon followed suit and signed up for long-term renewable energy contracts of its own. This year, Georgetown, which sits in the center of Texas oil-and-gas country, started getting all of its energy from wind and solar farms around the region. And, increasingly, it’s in good company. Small cities like Burlington, Vermont, and Aspen, Colorado, also boast a 100 percent renewable status, while many others are close behind. Grand Rapids, Michigan, for instance, currently gets 27 percent of its energy from green sources and aims to run on 100 percent renewable energy by 2025. This past January, Bowling Green, Ohio, a town of 31,000, unveiled the largest solar farm in the state, a 20 megawatt public-private partnership that will power roughly 3,000 homes. The very day Trump turned his back on Paris, 285 mayors announced that they would still uphold the agreement's goals. Then there are towns and cities like Moab, Utah; Pueblo, Colorado; and, yes, Abita Springs that are just getting started. LeAnn Pinniger Magee, who chairs the mayor’s Abita Committee for Energy Sustainability, says the town’s first step is to install solar panels on its big electric welcome sign and also install an electric vehicle–charging station on site. The project, she estimates, will be completed this summer, and shortly afterward the town plans to launch a solar-powered street light pilot program that, if successful, could save it $20,000 a year in electricity costs. Mayor Lemons, for his part, likens realizing his town’s renewable-energy dreams to eating an elephant. “You take one bite at a time,” he says. It will take a lot of small bites to make up for the Trump administration’s decision to skip the meal altogether. Then again, there are a lot of committed people at the table, and more are joining every day. On June 2, the day after Trump withdrew from the Paris agreement, the mayor of Pittsburgh announced his city’s intention to generate all of its electricity from renewable energy by 2035. Santa Barbara, California, soon followed suit, declaring on June 6 that it would like to run entirely on renewable energy by 2030. Later this month, meanwhile, the nonpartisan US Conference of Mayors will vote on a resolution that would declare its support for 100 percent renewable energy in cities nationwide. Indeed, whether or not the fossil-fuel lobbyists and their friends in the Trump administration want it, the clean- and renewable-energy revolution is well underway—and it’s urban.